Formerly an independent state under rule of Denmark or the Danish crown, this country achieved independence during the years of the Second World War, back in 1941. A republican government was established some three years later and ever since the national flag has been flying independently from flag poles of all kinds throughout the Iceland territory. 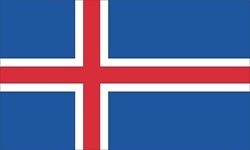 The traditional colors if Iceland, white and blue, are those of the civil flag adopted in 1915. The typical cross reflects the country's place in the Scandinavian cultural area. The state flag, which is also used by the armed forces, is a swallow tailed, a form that is frequently used in the Scandinavian area. The national coat of arms, on a base representing part of the rocky coast, includes a bull, a vulture, a dragon, and a giant, the island's four legendary protectors which appear in the so-called "Heimskringla." Iceland flags for display with flag poles, including residential flagpoles and such are available here.